JMT’s work on the FDR Boulevard (Phases 1A and 1B) project in St. Mary’s County, MD was recently recognized by the County Engineers Association of Maryland (CEAM) as a County Project of the Year (Large Project category). FDR Boulevard is a 1.7-mile roadway that extends from First Colony Boulevard to MD 237 (Chancellors Run Road) and includes 10 intersections. The project included alignment studies and designs for a divided two-lane landscaped boulevard section with bike lanes. The boulevard encourages more bicyclists and pedestrians to travel with the inclusion of a bike lane, 5-foot-wide sidewalks on each side of the road, and 10-foot-wide multi-use sidewalk at the roundabouts. 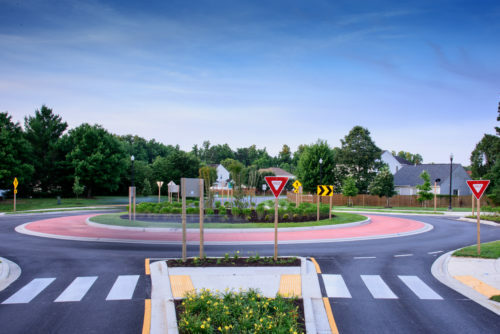 Three roundabouts are used to calm traffic and provide safe and attractive intersections.